Advanced kidney cancer has a potential to spread to other parts of the body like lungs, liver or bones; however in certain rare circumstances, the tumour grows within the veins of the kidney and blocks the main vein of the body (inferior vena cava) going towards the heart. This blocks the flow of blood to the heart and may lead to severe complications. A piece of the tumour can also get detached and get lodged in the heart or lungs causing sudden death. Fortunately, even in this advanced stage, removal of the kidney and the tumour thrombus (clot) from the vein can potentially cure the patient. This is usually done via conventional open surgery due to the complexity involved in blocking multiple sources of blood supply to the vein, opening the vein, removing the tumour from it and reconstructing it in a way that there is no leakage of blood from it. This involves a large cut (incision) on the body and results in significant blood loss, high complication rates and delayed recovery. Robotic surgery can now be offered in this rare condition to enable the patient to recover faster with less pain, discomfort and blood loss. 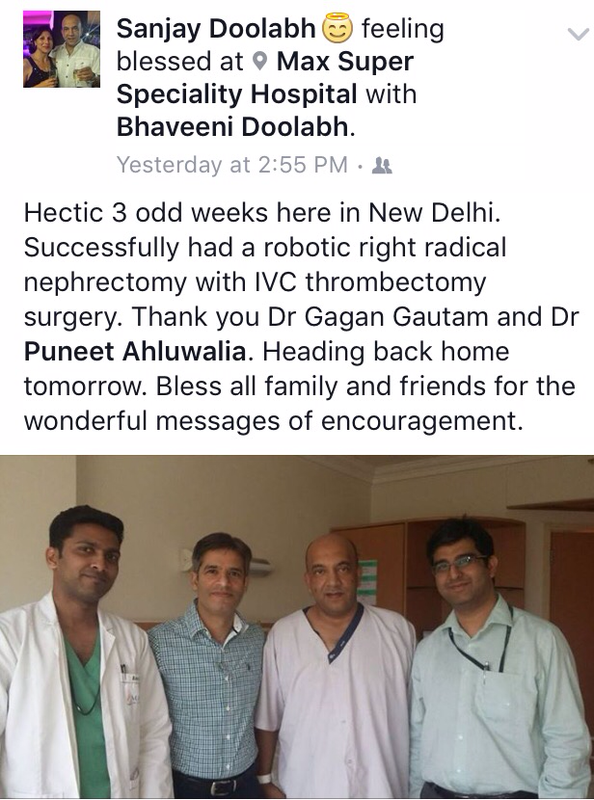 This procedure, technically known as robotic radical nephrectomy with IVC thrombectomy, was recently performed by Dr Gagan Gautam – Head of Urologic Oncology and Robotic Surgery at Max Institute of Cancer Care, Saket, New Delhi on Sanjay Doolabh, a 46 year old businessman from Zimbabwe, who was discharged 3 days after surgery and flew back to his country in a week. Dr. Gautam has been trained in robotic surgery at the University of Chicago and currently leads a team of urologic cancer surgeons who perform robotic surgery for prostate, kidney and urinary bladder cancer at Max Institute of Cancer Care, Max hospital, Saket, New Delhi. Heading home – the patient’s side of the story..
Dr Gagan Gautam is the Head of Urologic Oncology and Robotic Surgery at Max Institute of Cancer Care, New Delhi, India. 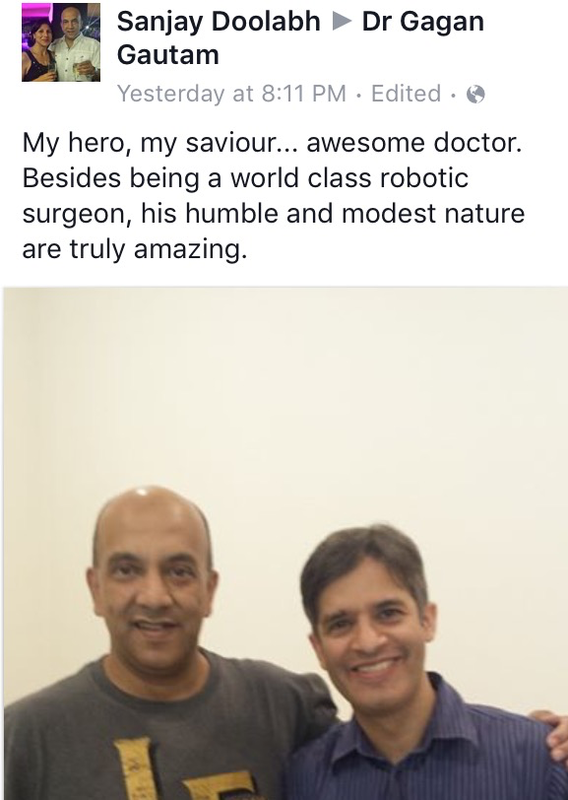 He has played a key leadership role in establishing robotic surgery programs in India and has trained and proctored many surgeons in robotic surgery for kidney, prostate and urinary bladder cancer.